Starting Friday, a stretch of one Lowell canal will be bathed in shifting colors, and Lucy Larcom Park will feature artists, music, and food for the weekend-long Winterfest. LOWELL — From Lowell’s founding nearly two centuries ago, the city’s lifeblood was the water that coursed through its canals and powered its many textile mills, which by the 1850s formed the country’s largest industrial complex. Now, city officials are again turning to the waterways in hopes of further fueling Lowell’s revival in the post-industrial era. Starting Friday evening as part of a weekend-long Winterfest, a stretch of one canal will be bathed in shifting colors, and the area flanking the canal, Lucy Larcom Park, will feature fire artists, music, and food. It’s a first phase in what project boosters hope could lead to the illumination —and enlivening — of much of city’s the 5.6-mile network of canals. Some have even suggested the time has come to dust off plans for gondolas or water taxis, a fitting development, perhaps, for a city that was once known as the Venice of America. Lowell joins a growing number of cities that have turned to illuminating waterways as a way to spur economic development. 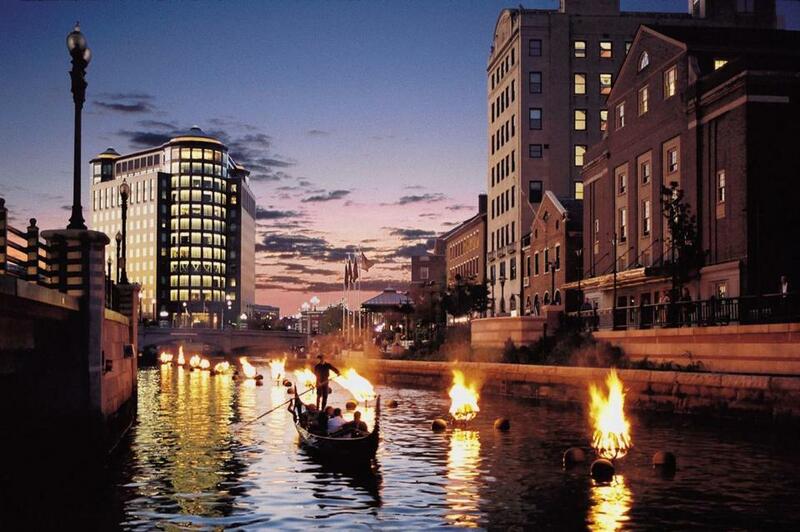 Two of the most prominent examples are WaterFire in Providence, in which sections of the downtown river are illuminated with floating fire sculptures, and the River Walk in San Antonio. In Europe, annual light festivals are held in Lyon, France, and Amsterdam in which age-old buildings and bridges are transformed into canvases for shimmering light displays. Fires from a previous WaterFire installation in the Rhode Island School of Design section of Water Place Park in downtown Providence. Part of the reason city planners have turned to the concept is the growing affordability and capability of LED lights, which are energy-efficient and can be controlled by computer. “Lighting canals and waterways is an increasingly attractive option for cities, especially older ones like Lowell, because people forget the bridges and waterways because they tend to go dark at night and disappear,” said Todd Lee, a designer and architect who heads the advocacy group Light Boston, which promotes light-related art on infrastructure in the Boston area. To be sure, Lowell’s first step is a modest one. The lights at Lucy Larcom Park, which are already lit, will stay on throughout the year, as will those lighting the canal. It will cost the city about $150,000. 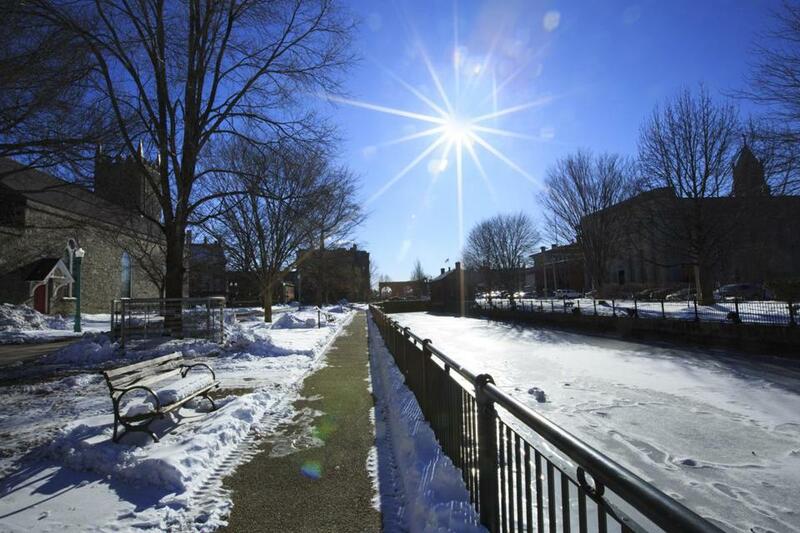 Lowell’s renewed focus on the canal system comes nearly 40 years after the federal government designated the whole downtown as a National Historical Park. The creation of the park in 1978 was intended not only to preserve Lowell’s unique history — as the country’s first master-planned factory town — but also to spur its economic redevelopment, an unprecedented mandate at the time. The effect of the park on the character of the city has been profound, from downtown’s cobblestone streets and iron lampposts to the millions of square feet of once-vacant mill space that have been rehabbed, thanks to federal tax credits and other incentives. The canal system was central to the city’s national park bid, said Paul Marion, one of the leaders of the Lowell Heritage Partnership, a civic group. Marion’s organization has launched what it’s calling “The Next Initiative,” a planning process that will seek input from residents, including a growing community of artists, on ways to enhance the canals. Some early ideas include light sculptures, climbing walls, and placing a floating swimming pool and deck in a canal or river — similar to a concept in Vienna. For all of the grand ideas being bandied about, development near the canals presents jurisdictional and regulatory challenges. Chief among them is the fact that the canal system remains an active source of hydroelectric power. Enel Green Power North America, part of a multinational renewable energy corporation, owns and operates a 20-megawatt plant near a dam on the Merrimack River, at the headwaters of the canal system. As such, Enel has rights over all of the city’s canals. While city officials have in the past lamented Enel’s lack of participation in revitalization efforts, an Enel representative was on hand at a recent canal planning meeting, though the company has not contributed financially to the project. “As a local business and the owner of the canal waterways we are listening, engaged, and at the table to be a part of this important conversation,” an Enel spokeswoman said in a written statement. One might also expect some friction between canal boosters and the National Park Service, which imposes strict design standards throughout the historic park. But park Superintendent Celeste Bernardo expressed enthusiasm for the lighting project, noting that $51 million in federal, state, and city funds had already been invested in canal improvements, such as paths, landscaping, and historical markers. The planning for lighting and otherwise enhancing the canals is being led by Daniel Koff, a designer whose firm created an award-winning interactive history tour of downtown Lawrence. Ted Siefer can be reached at tedsiefer@gmail.com.